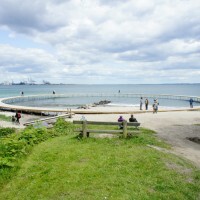 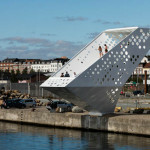 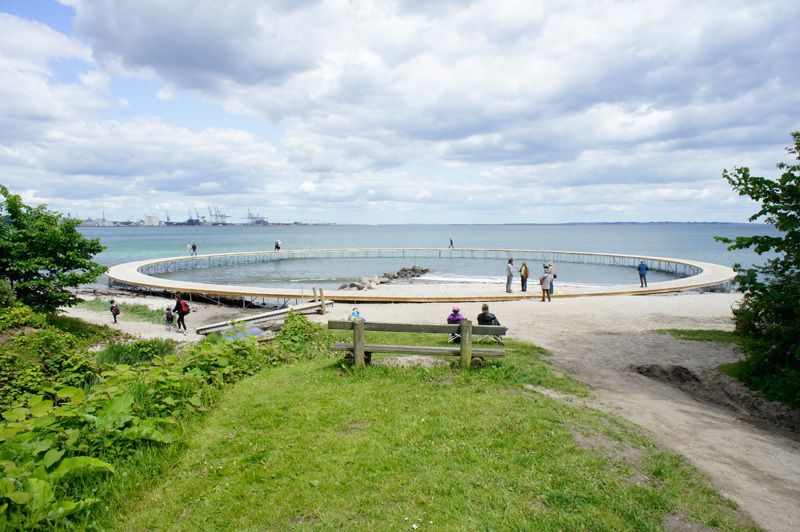 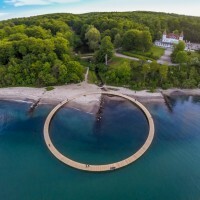 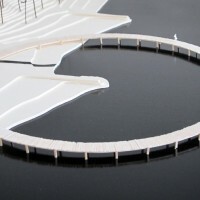 Danish architecture studio Gjøde & Povlsgaard Arkitekter have designed The Infinite Bridge, a sculpture that has been built and exhibited as part of Sculpture by the Sea 2015 in Aarhus, Denmark. 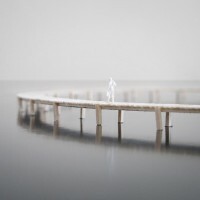 “We have created a sculpture that is all about experiencing the surroundings and becoming aware of the relation between the city and the magnificent landscape of the bay. 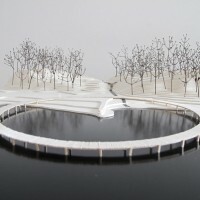 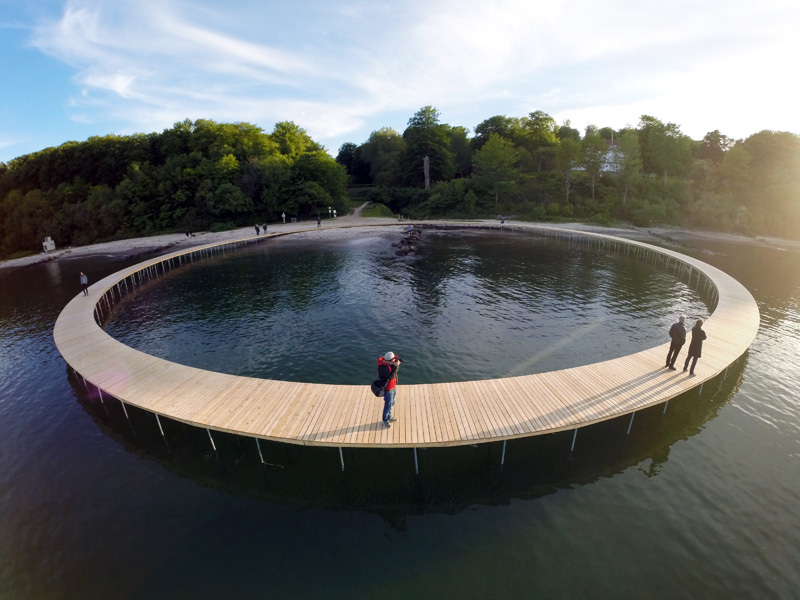 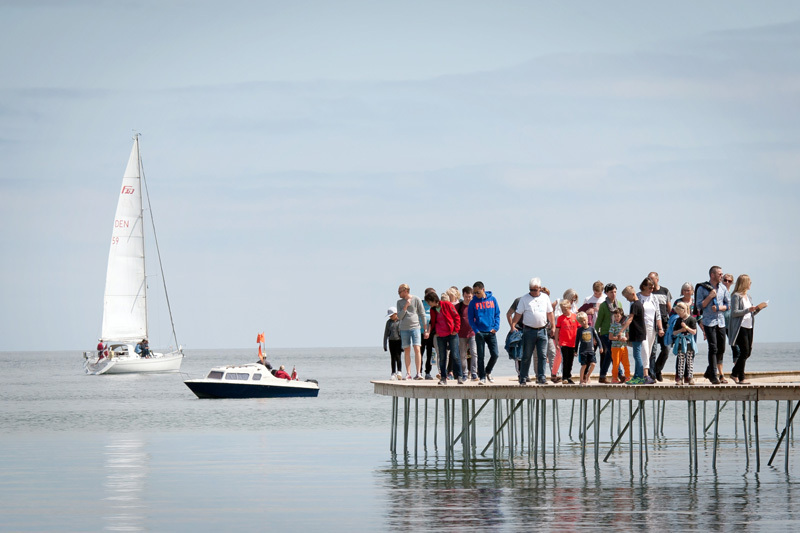 Walking on the bridge you experience the changing landscape as an endless panoramic composition and at the same time you enter a space of social interaction with other people experiencing the same panorama,” says Johan Gjøde, partner and co-founder of Gjøde & Povlsgaard Arkitekter. 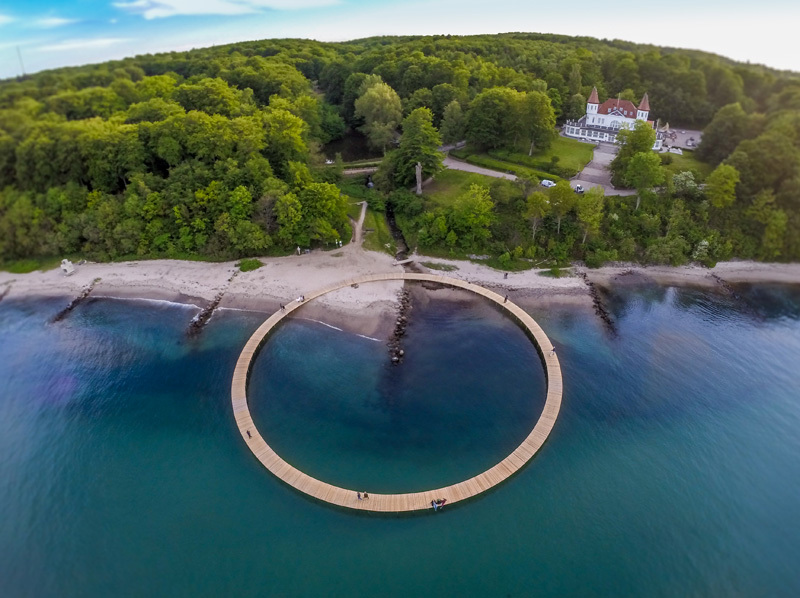 The Infinite Bridge has a diameter of 60 meters and is positioned half on the beach and half in the sea. 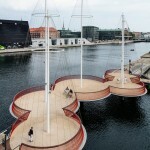 It consists of 60 identical wooden elements placed on steel pillars housed about two meters into the sea floor. 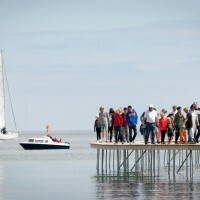 The deck of the bridge rises between one and two meters above the water surface depending on the tide. 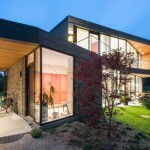 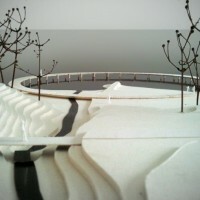 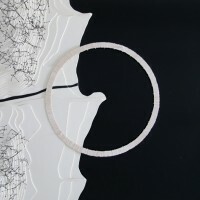 The curvature of the bridge follows the contours of the landscape as it sits at the mouth of a small river valley extending into the forest from the beach. 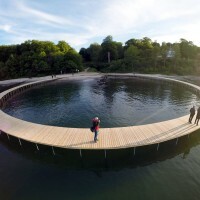 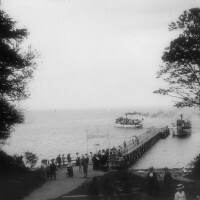 “The bridge touches the landing dock of a previous pier located at the site where people used to arrive in steamboats from the city to relax and enjoy themselves. 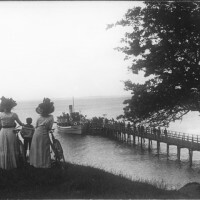 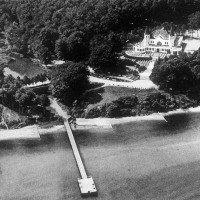 The historic Varna Pavilion that sits on the hillside above the beach was a popular destination in the scenic landscape with its terraces, restaurant and dancehall.Situated on the edge of the forest facing the sea the pavilion was meant to be experienced from the landing dock of the pier that no longer exists. 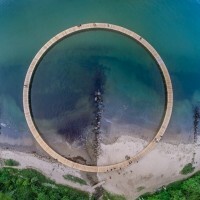 The Infinite Bridge reestablishes this historic connection and offers a new perspective on the relation between the city and the surrounding landscape,” says Niels Povlsgaard, partner and co-founder of Gjøde & Povlsgaard Arkitekter. 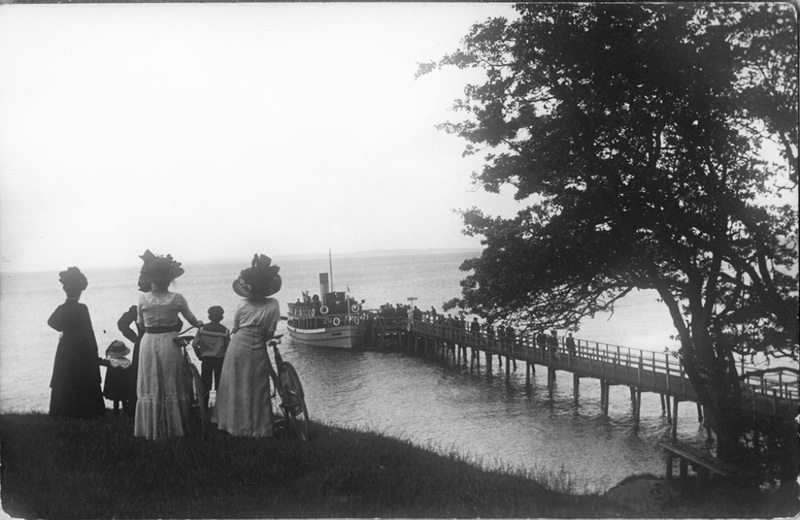 All other photography as noted.